Thanks to the Internet Of Things, we can stay in touch with almost any household appliance to make sure everything's ticking over safely and efficiently while we're away. Instead of trundling blindly into chair legs and getting stuck on a LEGO brick, Dyson's robot cleaner is fitted with a 360-degree camera that can visualise the whole room at once and tank tracks to carry it over obstacles fool enough to remain in its path. 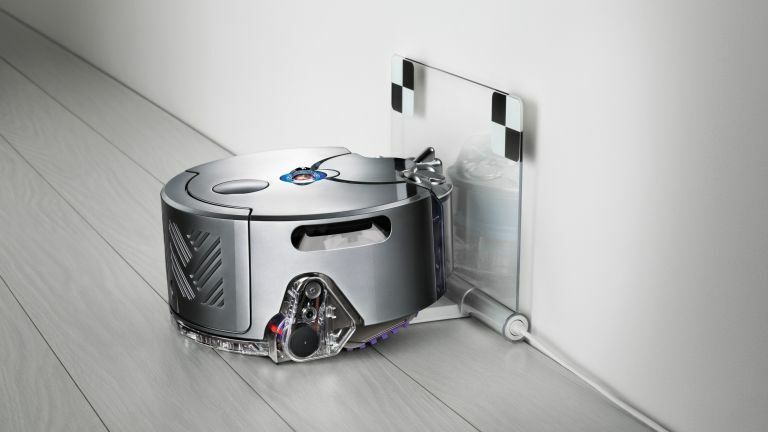 Its miniaturised motor and root cyclone technology generate more suction than any other cleaning 'bot, but what we like best is the accompanying Dyson Link app that lets you watch and map your robot's route around the house and schedule his cleaning rota for the rest of the week. It's becoming hard to find a thermostat that doesn't learn your heating habits and message your smartphone these days, but Ecobee3 manages to outsmart the rest, by considering the temperature in multiple rooms. It's a simple case of adding remote sensors that communicate conditions over wi-fi, but it means the software can account for hot and cold zones in addition to the weather and time of day. The sensors can also detect motion and shut off your heating when you leave the house, or remain utterly still. A keyless lock you open with your phone sounds clever, until your smartphone dies, or the internet goes down and you're locked out. Lockitron hopes to overcome the smart lock skepticism by using a low energy Bluetooth signal from a watch, or key fob, as well as your phone, to slide the bolt. If you have a Pebble watch, you can simply fist bump your way inside and grant others with the right app on the smart device, keyless access to your castle. Add the optional Bridge unit to the basic Bolt if you want to monitor your door across the internet from abroad, or issue door passes by email to your guests. With its three-axis motor and face recognition software tracking your own movements, it feels unnervingly like this talking robot has a mind of its own. In fact, it does have enough AI to hold a rudimentary conversation and by accessing all of your social media streams, it can get to know you quite well. Don't worry, JIBO's directive is to help, not take over. Not just yet anyway. Think of it as your PA and friendly interface between you and your other smart home gadgets. However many smart kitchen appliances you have, you still need a chef to make the magic happen. But even that could soon be a robot. This fitted kitchen comes with fully articulated robotic arms and hands that measure, chop, stir and cook according to a rapidly expanding library of online recipes. Every nuanced motion and flourish of Master Chef Tim Anderson has been meticulously copied already and the learning process will continue until launch day in 2017. Until then, you can watch the disembodied arms at work in demonstration modules that arrive in 2016. A washing machine with wi-fi? How else would you keep in contact when you're in another room, or at work? This is a huge 12kg machine, with an impeccable efficiency rating, but the big advantage here is being able to trigger a wash remotely so the spin cycle ends just as you get home. You'll receive a text when it's done, or if there's a problem and you can check the Smart Control app on your iOS, or Android phone at any time to see how things are progressing. Going a step further than simply surveying the comings and going of your home, this security camera uses face recognition software to let you know exactly who's there. You can even use the app to log the movements of your family and if they invoke privacy laws, you can assure them that all video footage is stored locally on an SD card and not in the cloud. The device also has an integrated speaker, so if an unregognised face appears, you can welcome the stranger to your home, before releasing the hounds. This mechanical mixologist can serve up any cocktail you dial into the companion app in less than five seconds. Currently there are 300 recipes on file in Somabar's software, which draw ingredients from seven sealed compartments, combining them with a level of precision clumsy human barkeeps cannot match. So there's a little less bottle twirling here, but also a lot less waiting, which means considerably more drinking. We've yet to find a universal remote that can banish all others to the back of the sofa forever. But until now, we've not had one that can recognise our palm and default to our favourite settings as soon as you pick it up. An unassuming aluminium puck that sits on your coffee table represents the brains of this outfit, bouncing IR and Bluetooth signals to all of the appliances within its sphere of influence. There have been similar solutions from Logitech and the like, but never so personal or easy to program. Meet Mr Coffee, your filter friend who will brew a carafe of the black stuff when you send the instructions from your smartphone. Wi-fi connectivity and a coffee-centric companion app enable you to trigger a brew on your way home from work, or create schedule for the week timed to coincide with your morning dash for the train. It's essentially a rather smart-looking 10-cup capacity filter coffeemaker finished in brushed steel and made all the smarter by Belkin's inbuilt WeMo technology. And if you don't live in the US, you can achieve a similar effect by adding a WeMo Insight Switch to any regular coffee machine and using the same app to activate it. Is Dyson's new autonomous robot vacuum set to rule them all?